Jordan Brand has been reinventing their past sneaker to impress the sneaker market and they have been doing a great job, producing good results and stirring excitement like with the new edition of the Jordan Son of Mars. 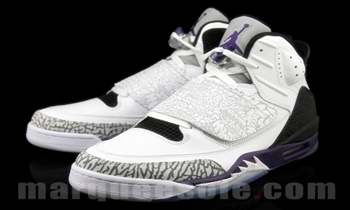 This returning sneaker, the Jordan Son of Mars, is scheduled to be released in a Bordeaux edition. But aside from the popular colorway, this silhouette will also be coming out in a convention varsity purple colourway, which looks very simple, but absolutely features great improvements from the past version of the shoe. Expect this to drop anytime in the market this February or March.